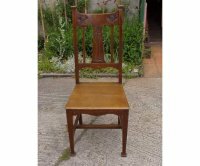 An Arts and Crafts oak armchair by Shapland and Petter with stylised floral details to the head rest, shaped back splats and shaped legs. Shapland and Petter. 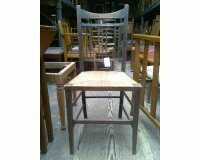 A quality suite of ten Arts and Crafts oak dining chairs with a rare three seat model. 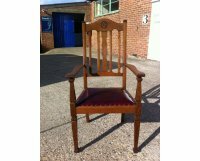 These have all been totally restored, all gently knocked apart, joints cleaned, glued, re assembled and clamped, refinished and waxed and have been professionally re-upholstered in a quality leather. 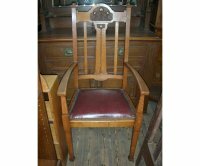 A good Arts and Crafts oak rush seated chair by Shapland and Petter with an unusual backrest heart with cut-out. A wide apron below the seat with subtle shaping to it, turned front legs united by floor stretchers. It has been professionally re-rushed. 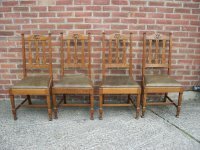 A set of four Arts and Crafts dining chairs with stylised floral carved head rail and back splats, the front legs with gentle 'in and out' curving to all four facets. These have all been totally restored, all gently knocked apart, joints cleaned, glued, re assembled and clamped, refinished and waxed and have been professionally re-upholstered in a quality leather. 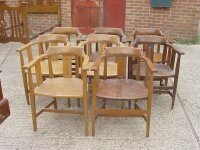 A good quality set of six Arts and Crafts oak dining chairs made by Shapland and Petter. 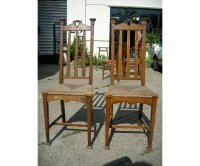 A pair of Arts and Crafts Oak armchairs by Shapland and Petter with shaped back. Re-upholstered in contempory Morris fabric. These would go quite well with the above set of six. Height 41". Depth 21", Width at arms 22", Height of arms 28", Height of seat 19". 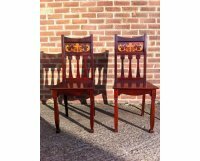 A set of six Arts and Crafts dining chairs by Shapland and Petter with stylised floral carving to the top and centre splat on square tapering legs. 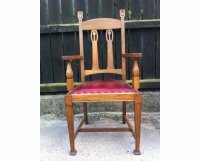 A set of four Arts and Crafts oak dining chair's attributed to Shapland and Petter with simple serpentine shaped backs, giving comfortable seating position. 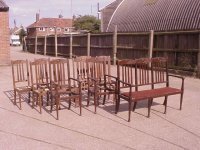 These have all been totally restored, all gently knocked apart, joints cleaned, glued, re assembled and clamped, refinished and waxed. 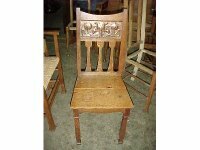 An Arts and Crafts oak hall chair attributed to Shapland and Petter in the manner of M H Ballie Scott with stylised floral carving to the back. A good Arts and Crafts Walnut armchair attributed to Shapland and Petter with elongated back upholstered head rest with a pewter heart to the centre splat on trumpet style feet. 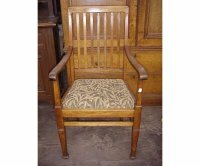 A solid Arts and Crafts oak armchair with stylised floral cut-outs to the top upights, totally restored and professionally recovered in a quality hide. 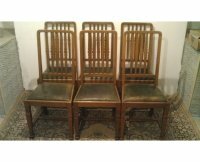 Three Arts and Crafts oak dining armchairs by Shapland and Petter, with stylised floral carved details to the back splats and stylised floral cut-outs to the head rests, now professionally recovered in a quality green leather. 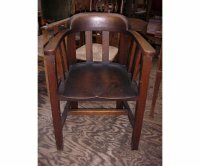 A set of eight Arts and Crafts oak armchair's made by Shapland and Petter with shaped head rest, cutouts to the side and back splats and contoured seats with a good stretcher arrangement. Shapland and Petter. 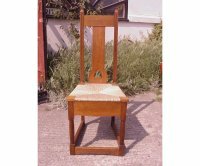 A long run of Arts and Crafts oak tub chair's with shaped solid seat and shaped head rest, an interesting detail to the back legs set at 45 degrees to the front legs adding to these well designed yet simple good quality armchairs. Circa 1910. An image of this tub chair from the 1903 S&P catalogue. 34 in stock. 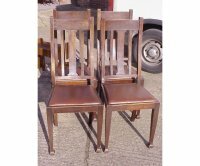 An unusual pair of side chairs by Shapland and Petter with original rush seats and Heart shaped carvings to the tops. Shapland and Petter. 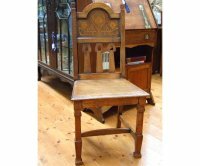 An Arts and Crafts oak chair with arched top and wonderful Peacock inlays to the back panel with three slats below pierced with hearts and shaped front legs. Illustrated in the S&P book page. 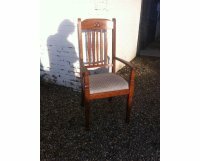 An oak double piano stool or window seat by Shapland and Petter.